Scores from the: I'll talk, I'll talk, I'll tell you anything you want to know, just make the wind stop, bike tour. Torture: It is obvious to me that you can get anyone to say anything. You want me to say I'm Bin Laden's driver? I'm Bin Laden's driver. Just make the wind stop. Fatigue: Forget that crap that I'm not fatigued. I just rode 107 miles into the heart of Katrina. What do you think? Chris: "It was warfare on the bike today". Goats: Every time we pass a goat we speak of you Rich. Stampedes: For some reason we stampeded everything today. Cattle, horses, even elk on a farm. Beauty of the route: It reminded me of State Road from Harbor Springs to Cross Village. However it was 107 miles into the wind. Little know fact: The plains have been almost entirely plowed for crops except for the Flint Hills which we rode through today. They have a limestone crust and you cannot plow. 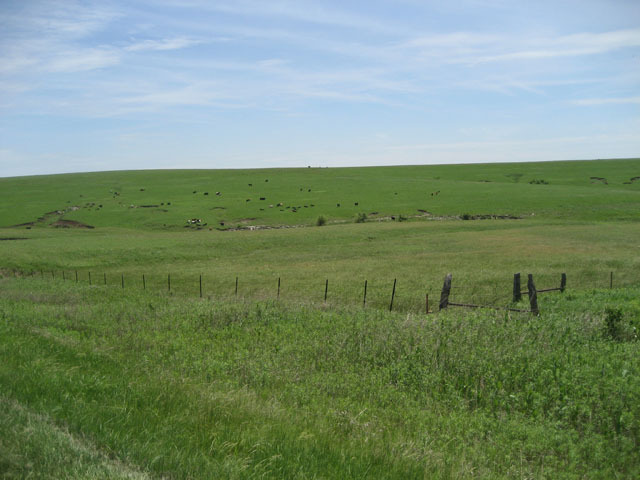 Therefore you have the native grasses that give you a glimpse of the beauty of the plains before farming. It is my wonderful son David's birthday today. He is now an adult and in a training class for his work today. Have a great day Dave. We all knew it would be a long day and some riders left early. I rode with the same group, Jim, Chris, Peter and Willie. Chris had to replace a tire and tube early in the ride so all the riders were at the first SAG together. It was a beautiful route and just a fierce headwind all day. My group rode together to the second SAG. Jim and I left first and Jim took off and Jim did not want to get caught. If Jim does not want to get caught, I am not going to catch him. I could see him, just not catch him. At the 92 mile mark he stops for pie and I continue on. Door to door it took me 8 hours and I was the first one in. A very tough day. Tomorrow is 85 miles to St. Joseph, Missouri. The Flint Hills in Kansas. Beautiful. First SAG of the day. Do not encourage your Dad! Al, hate to be redundant, but we don't care where you finish, just that you finish. No more first finisher stuff. We support you 100%. 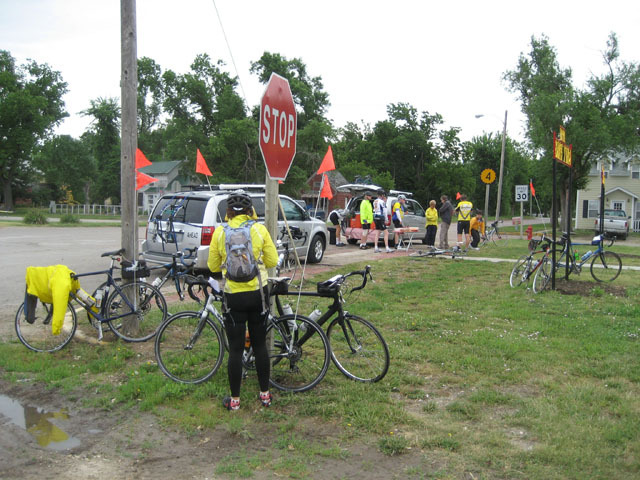 Sent 2009-06-04 from Dan G.
Dad - Hope you are wearing your yellow jersey today! Love you! you are doing really well!!! You will be talked about forever!!! I was imagining what Father would comment about this endeavor. I think it would have been very entertaining to hear. 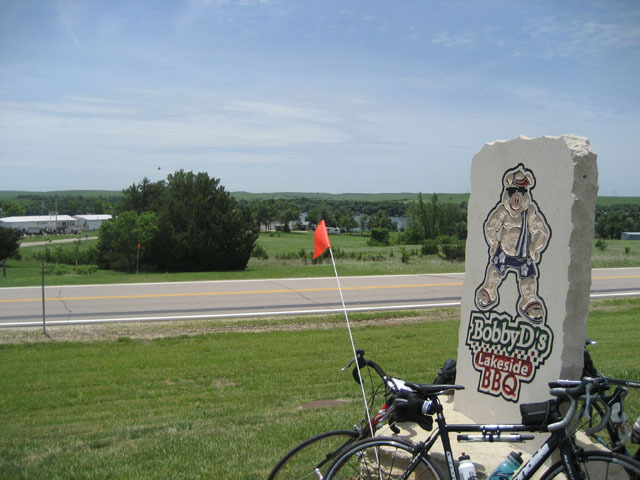 So did you eat at Bobby D's? Sent 2009-06-03 from Dave M.
AL - Today we drove from AA to Albany and I was scouting out your route to here. there are some hills! Tomorrow, we drive to Boston, so I'll check out the route to there as well. PS: Did Larry really think you never picked anyone from Kansas? You and I will always remember the infamous Jared Haase. You took him in the first round -- and I took Raef LaFrentz the only time I've ever had the first pick -- the year Kansas was a #1 seed but lost in the second round to Arizona. Al, I was a couple of weeks behind in the blogs, photos, and comments. Now I am caught up and will not let that happen again. You are an inspiration to all, as well as an easy target for barbs from the hundreds (or thousands?) following your ride. The blogs and photos are informative and entertaining, though they are occasionally trumped by the comments. The best are from Chuck, Roddy, and Bubbie.